SIMIEN MOUNTAINS, ETHIOPIA—In the end, I couldn’t do it. I looked up at the big narrow rock that had a number of awkward indentations leading up to a flat outlook point. From there, I would be able to see not only the beginning of the Jinbar waterfall, but also watch as the water tumbled down 500 meters of rocky cliff to the bottom of the valley. 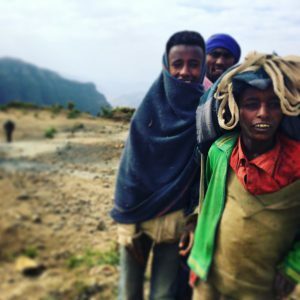 I carefully put my right foot on one step, grabbed the hand of my local guide, David Yohannes, and put my left foot on the next step, reaching for the arm of Dawit Teferi, who had been my guide since we had left Addis Ababa and travelled around northern Ethiopia. But then I freaked out, realizing there was a sheer drop on the right side and a gradual drop (which quickly led to another sheer drop), on the left. Since climbing out of a gorge in Zimbabwe 17 years ago and having a massive panic attack that has made me paranoid of steep uphill climbing—and long up escalators—ever since, I have been hesitant to do trekking that requires much vertical climbing. “Come on, you can do it,” Dawit said, trying to encourage me. I looked down at the gorge below, began to put my foot on the next step, and then quickly turned and scrambled down, giving the gelada monkeys we had seen earlier in the day a run for their money. I felt defeated and mad at myself for being a wimp but then David showed me that down a slight hill, there was a view of the top of the waterfall, which was rather miniscule in what was currently the dry season. It was beautiful, but definitely not worth a potential anxiety attack at 3000 meters in the Ethiopian Highlands. About five hours into our journey we passed through the village of Zarima (where in the midst of a goat market a young mountain girl asked Dawit if I was a man or a woman because I was wearing trousers). Soon after, the winding road became rocky and more of a dirt track. Called Limalino, it must be one of the scariest passes in sub-Saharan Africa, with steep drops I did not want to contemplate. We saw an overturned bus, with locals standing by and inspecting the smashed windshield. Our Tigari driver buckled down and kept his eyes glued to the road. We finally reached Debark, the gateway to national park, where we picked up David and a scout armed with a Kalashnikov. I am not comfortable with guns and asked if he could keep his gun in the boot but was told that he had to carry it in case we came across leopard (I found out later from David, one of 12,000 people who live within the national park, that he had only once seen a leopard). 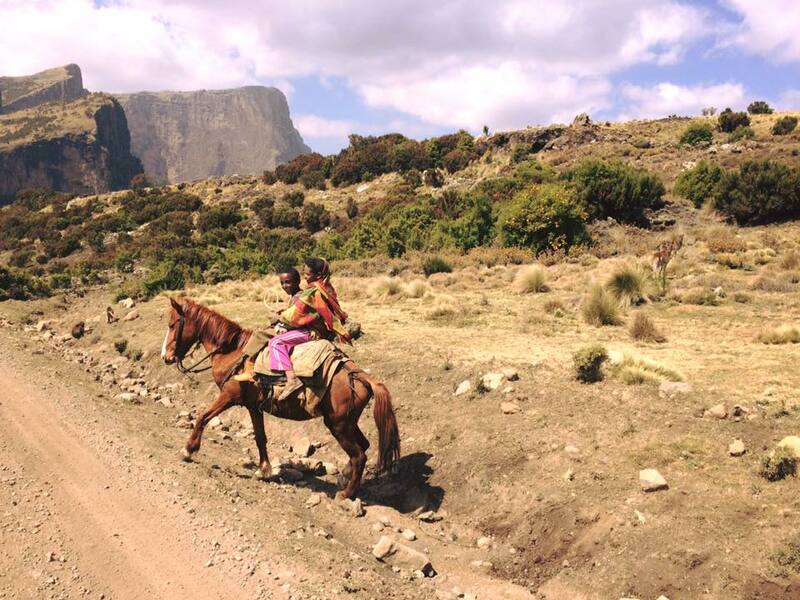 We bumped past small dusty villages with men plowing fields with horses and women carrying baskets filled with injera (a crepe-like staple of the Ethiopian diet). At one point we came across a sloping field full gelada, also known as the bleeding heart baboon. There were probably 100 of them quietly eating grass and wild thyme. David told me I could get as close as five meters to them, but I hesitated at first; interestingly they are nervous around Ethiopians because they chase the monkeys out of their villages and sometimes even kill them (despite a possible prison sentence of up to seven years) but with white people they seem to be fine. I quickly realized however they were more interested in eating—which with a group of them munching sounded like a gentle babbling brook—and tumbling around with each other. 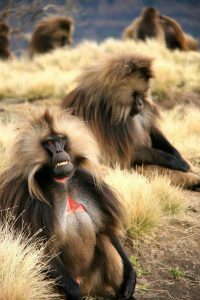 At one point, a female with a baby on her back got into a spat with another female and they made all sorts of noises; geladas are the most vocal monkeys in the world and have a complex range and tone of sounds. A male gelada finally came over and sorted out the issue but then he got into a full on fight with another male a few moments later, with dust kicking up and teeth being bared. The fight stopped when one of the females let off a haunting alarm sound and all of the gelada took off running up the hill. David figured they had seen either a leopard or a hyena, the two predators of gelada. After a good night’s sleep at Simien Lodge— said to be the highest hotel in Africa it is also the only sleeping option in the park unless you want to camp or stay with locals—we headed out in hopes of finding the two other endemic mammals in the park that are only found in Ethiopia, the Walia Ibex and the Ethiopian wolf. About 20 minutes into our drive, we came across about 200 geladas, near a breathtaking peak that looked out over the mountain peaks. Geladas spend each night sleeping on the steep cliffs below, safe from predators. Their morning ritual consists of grooming themselves and other members of their family and I stood entranced as they nitpicked each other. I also, for the first time, got a whiff of a scent I was never able to trace exactly—it smelled slightly like a skunk had walked by. Dawit at first thought it could be either the local yellow Guassa grasses or the Erica Arborea (the dominant flowering tree of the mountain), but smelling them, I knew it had to be something else. As we headed back towards our car, we waited while a local “Obama” bus filled with villagers passed by; introduced in 2008, the Isuzu transport truck takes its name from the US president who was elected the same year. Near Sankaber (3250 meters), the first camp where many trekkers begin their walk, we came across a large group of men and young boys standing around with their mules, hoping to pick up a trekking job for a few days. We headed onwards, passing very young shepherd boys and girls responsible for their families’ sheep and goats (one girl told us she was five). We soon neared Kurbet Metaya (“throwing of skins”), an opening between two massive rocks that had a straight drop below, plus a stunning view of the lowlands areas. The landscape is striking, thanks to the fact that it was formed by countless eruptions some 40 million years ago. With layers of lava piling up, the erosion that followed over the millennia created this serrated landscape. As I took a number of photos over the valley, David –his years of shepherding leaving him with a sharp eye—found a male Ibex with giant horns down about 250 meters, lying in the rock’s crevice. David told me I must be good luck, as he estimated a sighting of Ibex happened about 60% of the time with tourists. As we ventured on towards Chenek (3600m), another campsite for trekkers, I spotted another Ibex on the side of the road, and then about a dozen more grazing with a group of lazy gelada. David told me that Ibex are often found with gelada because they share the same predators. Ibex have bad eyesight, so they rely on the monkeys for their sharp vision and the alarms they make when they see a leopard stalking in the grasses. As we watched the Ibex munching and wandering across the road to eat the dead leaves on the Giant Lobelia, David told me that during the rainy season, young shepherds bend the long leaves down to create an umbrella that protects from the hail and rain. We decided to have lunch sitting on a rocky plateau that looked out over more incredible jagged peaks. Sitting there, watching the thick-billed ravens swooping (hearing their wings pump with air to carry them along in the sky), I understood why the Simien Mountains have been dubbed “the roof of Africa.” It seems that you are about as close to the clouds as you can get, with flat earth far, far below. In the midst of my existential thoughts, a number of guides starting shouting so I scrambled off my rock perch to see what was going on. One had seen a female wolf crossing the road below us but by the time I got to where he had seen her, she had moved into a tree covering. The guide said she had a limp –he had seen her before so knew that it was a female. I stood in the spot for a number of minutes, hoping she would pop out of the clearing but no such luck. After lunch, we doubled back to the village of Ambaras. The day before the local church –named for Mary—had a saint’s day feast in her honor; each Orthodox church in Ethiopia is dedicated to a particular saint and they celebrate their saint day twice a year in the Ethiopian calendar, which has 13 months. There was a barrel of leftover brownish homemade beer called “swa” in the local Tigari language and “tulla” in Amharic, which is made from hops, barley and malt and takes about 10 days to make. A large portion of the village men and children were sitting on the ground drinking and whiling away the afternoon. After trying a sip—which I tried to spit out as politely as I could— we were invited to the house of a local farmer to have both coffee and watch as his wife made injera. 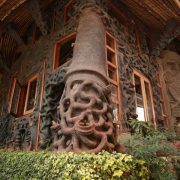 Their home was typical of the village, with a thatched roof, dirt floors and walls made from dirt, dung and straw. The couple and their two children slept in the same bed, which was about two meters off the ground, and underneath at night their horses and goats slept in the space underneath. His wife heated in the fire a big round pan in order to make the injera, which is made from teff flour. She then took a cloth, which had been dipped with local oil made from grains, and rubbed down the pan. After several minutes she poured the liquidy injera (from a plastic water bottle) into the pan. She then covered it with a domed spherical lid made from dung. About five minutes later, she picked the injera off from the hot plate, putting it in a traditional injera basket to cool. She then offered us some wat, the Ethiopian version of curry— this one made with a chickpeas. It was delicious but spicy, thanks to peppers and garlic she had mixed into the paste. After saying our goodbyes, we headed towards Jinbar. It was a 25-minute rocky trek, past rhododendron, overgrown Queen Anne’s Lace, Abyssinian wild roses and a few olive trees. After reaching the clearing where I had balked at climbing up the boulder, we headed back to the car. David tore off a twig from the olive tree and started chewing on it, telling me that it served as a toothbrush for locals. He said that in the mountains, if you liked a girl, you would chew the twig in front of her. If she liked you, she would say that the twig made your teeth nice and white. If this exchange took place, it meant you could begin dating. I liked this mating ritual; much less stressful than climbing a boulder to look at a waterfall.